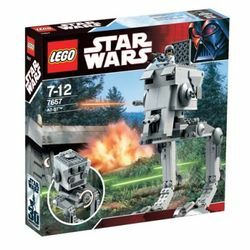 7657 AT-ST is a set released in 2007 as part of the Classic Star Wars line. Included is one AT-ST Pilot minifigure. AT-ST stands for All Terrain Scout Transport. The AT-ST Walker was released as part of the first wave of LEGO Star Wars in 2007. It came with one minifigure: An AT-ST Pilot, which marks its only appearance in this set. Notable features of the walker include a rotating body/cockpit, which is operated by a technic knob at the rear, movable "legs", movable front guns, rotating side armaments and finally, an opening hatch on the top of the walker, which leads directly to the cockpit. The cockpit is made up of a seat and a holding piece which stores the pilot's gun (a x1740 gun which was introduced in 2007). The exterior pieces are all either medium stone grey or dark stone grey in colour. Grey lightsaber pieces are used in the movable front guns. Colloquially known as a "chicken walker" because of its shape and walking motion, the AT-ST was a heavily armed light ground combat vehicle. It was equipped with a chin-mounted double medium blaster cannon, a concussion grenade launcher on the starboard side of its head, 2 durasteel feet with claws, and a blaster cannon on the port side. It was designed to be a recon hit and run vehicle. It was lighter than its bigger brother the AT-AT walker and could withstand standard blaster fire, but was vulnerable to heavy laser fire and missiles as well as physical attacks to the legs and the side of the head, as seen by the Ewoks destroying AT-ST's by logs ramming the sides of the heads. They also could be forced into by species with great physical strength, like a Wookiee; as seen by Chewbacca forcing his way through the top hatch and taking control of the walker. Properly thrown grenades could be thrown into the window hatches, as well. The chin guns had an effective range of two kilometers and were used for anti-vehicle attacks, while the blaster cannon and grenade launcher provided close-range protection against infantry and light emplacements.. AT-STs were piloted by a crew of two drivers. The bipedal propulsion system was one of the primary weaknesses of the AT-ST. While on even terrain the walker could achieve over 90 kilometers per hour, but on uneven or shifting terrain a walker could quickly become unbalanced enough to fall over. This is a description taken from LEGO.com. Please do not modify it. Patrol for Rebel spies! Move out with the All-Terrain Scout Transport (AT-ST)! Patrol the forests of Endor or the ice fields of Hoth with this all-new version of the Imperial scout walker. Features side-mounted weapons and an opening pilot hatch straight from the movies. Turn the knob to make the cockpit rotate side to side! Includes AT-ST pilot minifigure with helmet and blaster!